ARLINGTON, Texas —DeMarco Murray may have eclipsed former Cleveland Browns icon Jim Brown as the first back in league history to start a season by running for at least 100 yards in seven straight games. But the fourth-year Dallas Cowboys workhorse knows he has a long way to go to reach the Hall of Famer’s elite level after his 128-yard, one-touchdown performance keyed a 31-21 defeat of the New York Giants Sunday. “He’s probably one of the greatest running backs to ever play, and I have a lot of respect for what he’s done,” Murray said. “In no way am I trying to say I’m on his level by any means. He’s a great guy, a great activist in the community, a great player and a great person. And I’m not even in that category. Murray, who leads the league in rushing with 913 yards and seven touchdowns, made history with his 1-yard run on the first carry of the fourth quarter, shaking off a gimpy right ankle that buckled on him late in the second quarter. He gave credit to his offensive linemen who kept prying open lanes against a Giants defense that stacked defenders in the box. “What an accomplishment,” Cowboys owner Jerry Jones said. “Anybody who knows how he got them, knows he got good help from his teammates. But I don’t know how you could have in this game of football, any more of a personal accomplishment to the will that it takes to get that won. And he’s the engine who makes these 6-1 Cowboys go. Colin Kaepernick and the San Francisco 49ers struck a deal Wednesday on a six-year contract extension, which sources told ESPN NFL Insider Adam Schefter is worth more than $110 million — including a record $61 million guaranteed. The deal ties Kaepernick to the 49ers through the 2020 season and puts him among the 10 highest-paid quarterbacks in the NFL. His signing bonus will be $12 million, sources told Schefter, unique in that most big contracts for quarterbacks are in the range of $24 million to $40 million. Kaepernick was scheduled to make $1.073 million this season. When signing the contract, Kaepernick specifically requested that it allow the 49ers the flexibility to negotiate extensions with other players such as wide receiver Michael Crabtree. According to one source, Kaepernick specifically asked, “So this structure gives us room to try extensions with my teammates, right?” He was told yes. Since taking over the starting job from Alex Smith midway through the 2011 season, Kaepernick led the 49ers to their first Super Bowl in 18 years after the 2012 season — losing by three points to Baltimore — and then to the NFC title game again last season, a three-point defeat to the Seattle Seahawks, the eventual Super Bowl champion. The extension is expected to have strong implications for potential deals for Cam Newton, Andy Dalton and Alex Smith this year, along with those for Andrew Luck, Robert Griffin III and Russell Wilson next year, when they are eligible to sign their first contract extensions. A second-round draft pick out of Nevada in 2011, Kaepernick has thrived under former NFL quarterback Jim Harbaugh — and the coach has said how much he wants the mobile, strong-armed QB around for the long haul. Accomplishing an extension before the season is a big deal as the team begins its first year in $1.2 billion Levi’s Stadium at team headquarters. Since his first start in Week 11 of 2012, he’s the third-highest-rated QB in the NFL with a Total QBR of 69.6 on the 0-100 scale, behind only Peyton Manning (83.3) and Aaron Rodgers (71.3). According to Elias Sports Bureau, he is the sixth-youngest QB in NFL history to start multiple conference championship games. He’s started the last two, beating Atlanta in 2012 and losing to Seattle last season. Including the playoffs, his record against the rival Seahawks is 1-3 with 3 TDs and 7 picks, and 20-5 with 35 TDs and 9 INTs vs. all other opponents. Since his first start, he is tied for 4th in the league with 17 wins and ranks in the top 7 in both yards per pass attempt and yards per rush. He completed 60.5 percent of his passes in the pocket last season, a steep regression from his first year as a starter in 2012 (65.7 percent). In a sensational playoff debut in January 2013 against Green Bay, Kaepernick used his speed to run for a quarterback-playoff-record 181 yards and two touchdowns. Then, in a season-opening win against the Packers last September, he threw for a career-best 412 yards and three scores. Michael Strahan is in negotiations to join ABC’s Good Morning America. Strahan will remain cohost with Kelly Ripa of Live with Kelly and Michael, the Disney-distributed syndicated morning show. He’s expected to join the GMA ensemble in the studio a couple of times a week. Strahan, a former NFL player, is also an analyst on Fox’s NFL Sunday. He was a surprise choice to fill Regis Philbin’s shoes opposite Ripa on Live in the fall of 2012. Since then, he’s been widely praised for his warmth and versatility on-air. The Disney parentage of Live and ABC makes it feasible for him to shuttle between the two morning shows. Sources said GMA’s discussions with Strahan have been going on for months and are not tied to Josh Elliott’s recent departure for NBC Sports. The timing wasn’t right in 2010 when Doug Williams started talking to the Washington Redskins about a front-office position. But it was right in 2014. And, after talking for a few weeks, the Redskins and Williams finally agreed on a deal. The Redskins hired Williams to become a personnel executive under general manager Bruce Allen, bringing back a piece of the franchise’s storied past. 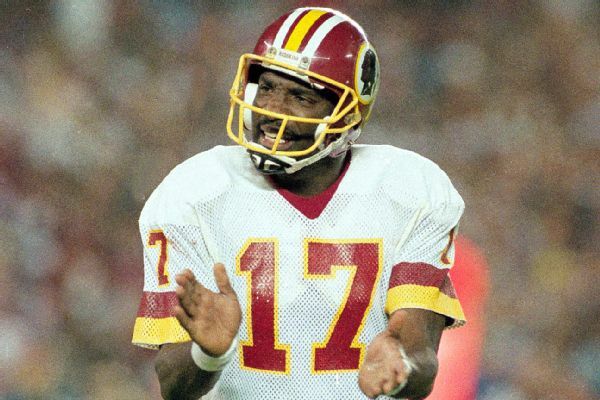 Williams quarterbacked the Redskins to a Super Bowl win after the 1987 season. He became the first African-American quarterback to play in a Super Bowl and earned MVP honors after passing for 340 yards and four touchdowns in the Redskins’ 42-10 victory over the Denver Broncos. “It’s great to be home again,” Williams said in a news release. “I have only one mission: to help this team obtain the talent it needs so the fans can experience the Super Bowl they deserve.” In 2010, Williams opted to become a general manager in the United Football League instead of joining the Redskins’ front office. Williams spent five years as a personnel executive with the Tampa Bay Buccaneers from 2004-08 — the same length of time that Allen spent as the Bucs’ general manager. Also, current Redskins coach Jay Gruden was an assistant coach with the Buccaneers during that period. Williams stuck around after those two left, serving as the Bucs’ director of pro personnel in 2009. He was Grambling’s head coach from 1998-2003 and again from 2011-13 before being fired in September. Williams has 17 seasons of NFL experience — nine as a player and eight in personnel roles. He played with Washington from 1986-89, was named a member of the 80 Greatest Redskins and is a Redskins Ring of Famer. It has been an underwhelming season for the Houston Texans, but eleven straight losses have not gotten in the way of wide receiver Andre Johnson’s yearly effort to bring some smiles to the faces of kids who could use them. Johnson has made an annual tradition out of giving twelve kids chosen by Child Protective Services in Houston on a shopping spree at Toys R Us. The kids have 80 seconds, in honor Johnson’s No. 80, to fill up carts with everything they can grab off the shelves. Every kid teamed up with a Texans cheerleader to race through the store and was guaranteed an entertainment system of their choice and two games in addition to anything else they grabbed. The Texans website has some great video from the event (seen below), which Johnson has hosted for seven years. The final tab for this year’s event was $17,352, which is a pretty impressive total given the short period of time the kids had to work even if it is a bit less than last year’s total.